We, at Clair-Ascension®, are totally committed to the ascension of this planet, via personal growth, physical, emotional, mental, spiritual and energetic empowerment. In truth, love, joy, compassion, forgiveness, grace, hope, beauty, respect, freedom, peace, prosperity, generosity, balance, health, creativity, harmony, unity and oneness, we are connected with all that is. Karen was practicing physical therapy for a number of years when she realized that she was often treating the physical symptoms without ever really getting to the core root of the problem. Karen then began adding mental, emotional, and spiritual components to her work. Karen is a certified Essence Repatterning Practitioner, identifying and reframing limiting mental beliefs, thoughts, attitudes, patterns, and behaviors. For example, sometimes a client with chronic pain has a parent who lived continually with pain. Therefore, in the client's mental construct of the world, the mental belief is, "life has a lot of pain." If a client can entertain the possibility that many people live relatively pain-free, then that possibility is open to the client, who has the opportunity to change his or her life belief from "life has a lot of pain" to "life is relatively pain-free." From the new belief system, the client can create a relatively pain-free existence. By adding into the equation that physical pain might also be an expression of unresolved emotional pain, and by delving into and passing through that emotional pain, one can often get a more comprehensive resolution of the physical pain itself. Karen has received "Cranio-Sacral Therapy" training including somato-emotional release. She also underwent several years of psychoanalysis to develop introspection with her personal thoughts and emotions. Lastly, sometimes physical pain is a reflection of spiritual disconnection. When one is reconnected spiritually, once again, often the physical pain is mitigated, if not completely resolved. 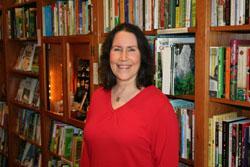 Karen has studied with spiritual teachers of several religions and philosophies around the globe. Clair-Ascension® was developed to approach the client's physical symptoms along with the mental, emotional, spiritual and energetic aspects, as well. Karen Greenberg has been traveling throughout the United States teaching personal growth and the Practical Application of Kabbalah, for well over a decade. She works with people of all faiths and philosophies and has studied extensively with spiritual teachers worldwide. Karen has a degree in Physical Therapy, was the Assistant Chief, and Clinical Supervisor of Students, at the Physical Therapy Department of University of Maryland Hospital. She has danced professionally in Baltimore, MD, and owned her own dance studios in Rockford, IL, and Farmington Hills, MI. She is a certified "Essence Repatterning" Practitioner, helping people to identify and repattern limiting beliefs, attitudes, and behaviors. Karen Greenberg's soul's purpose includes facilitating Healing for healers. Karen is a Registered Physical Therapist, who has been teaching her entire life: Physical Therapy Students at University of Maryland Hospital, Dance Students at Dance Studios that she owned, and for the last 18 years, traveling throughout North America, and Skyping Spiritual Seekers worldwide as a Metaphysical Teacher of Personal and Spiritual Growth.